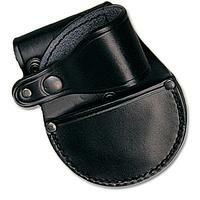 This leather Speedcuff pouch is has the same pouch support and three position swivel (vertical, 45 degrees and horitzontal) as other models. However this pouch has a rollover belt holder and single stud directional stud handcuff release. It weighs in at 148 grams (5.3 oz).